For 25 years, Ship To Shore Traveler has specialized in providing quality expedition clothing and equipment for professional and amateur travelers. 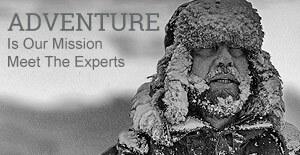 Our employees have joined expeditions in over 200 destinations worldwide. We know what you can expect, and what will keep you safe, comfortable and free to enjoy your adventure to the maximum. Our curated inventory incorporates the latest technologies in design and materials, and has been repeatedly tested by professionals in the field. Modern outdoor gear is stylishly designed and comes in a range of appealing colors, allowing us to offer you a variety of clothing and equipment that is both functionally practical and aesthetically pleasing. Once we know where you are going and when, what sorts of activities you plan, and what gear you already have, we will suggest items from our inventory to complete your kit. Our staff is adept at ensuring that your order is exactly what you need and an optimum fit. Ship To Shore Traveler guarantees you a full refund if you are not satisfied.